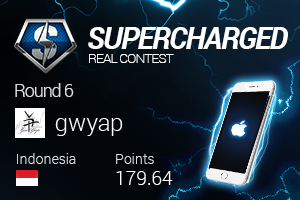 Winner of OctaFX Supercharged real contest Round 6 is awarded with iPhone 6! While 1307 participants are still competing for our Tesla Model S and other striking prizes, we are happy to congratulate our Overachiever and a master of EUR/USD currency pair - Mr. Yohanes Prayoga from Indonesia who won iPhone 6 in the 6th Round of OctaFX Supercharged real contest. Mr. Yohanes Prayoga uncovered his strategy and shared the experience of his participation in the contest in our regular column “success stories”. Don’t miss a chance to put on notice some tips from our winner. We thank Mr. Yohanes Prayoga for his tips! The new iPhone 6 will be sent to Indonesia to his new owner. Follow us on Facebook to see the pictures of the lucky winner! Every trader is welcomed to take part in OctaFX Supercharged real contest and compete for our 10 top-notch prizes including Tesla Model S, Smart Fortwo and Renault Twizy! You have a chance to win our prizes – trade with OctaFX, become a master of Forex trading! Our sincerest congratulations to the winners of cTrader weekly demo contest Round 16! One more round of cTrader weekly demo contest is over, and the results of the contest are announced. Round 16 was lucky for our 5 winners. Names of Round 38 OctaFX Champions announced! Great news - four more traders now can pride themselves being OctaFX champions! Our four luckiest traders can now share $1000 prize fund according to their places!